Blade Runner 2049 is an impressive work of art. The sequel to the 1982 classic is one that is best seen by going into it without doing anything but watching Blade Runner: The Final Cut. Oscar-nominated director Denis Villeneuve takes over the director’s chair from Ridley Scott. Those were some large shoes to fill for one of the most anticipated films of the year, but the Arrival director did so nicely as he continues an impressive streak that also includes Prisoners and Sicario – fans of the original should have nothing to fear. Villeneuve is aided in the filmmaking process by cinematographer Roger Deakins for their third collaboration. The screenplay was written by Hampton Fancher and Michael Green. It’s a long film but their vision translates very nicely on screen. Fancher was one of the writers of the original film and for all the hell he went through for the first film, it’s great to see him back in the fold for the sequel; their script could also be a standalone film set in the universe without having watched the original. Oh, there’s some beef with their script, but to talk about it would spoil the film. 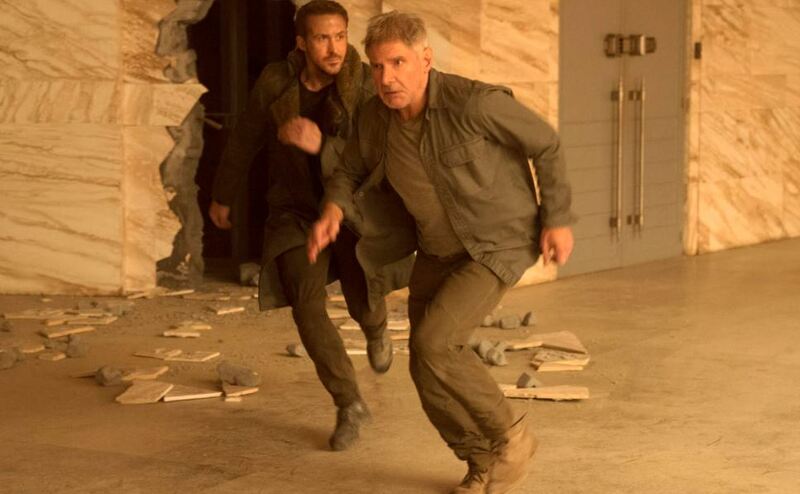 Ryan Gosling and Harrison Ford lead a cast that also includes Ana de Armas, Sylvia Hoeks, Robin Wright, Mackenzie Davis, Carla Juri, and Lennie James, with Dave Bautista and Jared Leto. One thing that can be said of Gosling: this film needed more Gosling. He is in just about every scene but it’s still not enough of the actor. Aside from a piano here and there, you’re not getting the musically inclined Gosling that was seen in last year’s La La Land. As far as Ford goes, it’s great to see the actor revisiting so many of his roles from the 1980s. One can’t help but wonder if we’ll see him revisit films we never thought would see sequels. Rick Deckard is the third role that Ford has revisited in the last ten years, joining both Indiana Jones and Han Solo – which role will be next for the actor? Without giving the film away aside from what can be seen in the trailer, all that should be said is LAPD Officer K (Gosling), a blade runner, discovers a secret that could turn the world upside down. This discovery is what leads K to search for Deckard (Ford). Similarly to Luke Skywalker in Star Wars: The Force Awakens, Deckard has not been seen in 30 years. All the old Replicants have been or are being retired by the Wallace Corporation, which has bought the Tyrell Corporation. In 2020, the Nexus 8s went onto the market with an easier way to determine if they are human or not. After a blackout from an EMP, a lot of data gets destroyed – one of the telling difficulties of the world going in a digital direction. There’s a lesson to be learned here, folks. Niander Wallace, an idealist scientist, has entered the fold. With the advances his company made, he’s purchased the remains of the Tyrell Corporation and put his vision in play. The new Replicants, the Nexus 9, are more compliant and obedient: they are realistic enough that you can’t quite figure out who is or isn’t one. Blade Runner 2049 is the only film in which cinematographer Deakins is credited in 2017. Fans of Deakins will certainly hope that this film is the one that gets him the first Oscar win after thirteen previous nominations. With that many nominations and even more films under his belt, he is long overdue for an Oscar win. His work in the sequel is impressive enough with so many amazing shots for Blade Runner 2049 to be the film that puts the longtime cinematographer over the top come Oscar Sunday on March 4, 2018. As the world looks nothing as depicted in Blade Runner’s 2019, there’s no reason to think that the 2049 depicted on screen will resemble what the world looks like when we reach that point. It’s more or less a continuation of the events that transpire in the 30 years in between films – Los Angeles has changed in so many ways as far as the design goes. The visual effects are just as impressive in Blade Runner 2049 as they were in the original film. They do take advantage of the increased technology available and are able to do more than Ridley Scott could in the previous outing. It’s a long film with a running time close to three hours, but it’s not one of those three-hour films where you’re asking yourself when it’s going to end – this isn’t a film that should be left until it hits Netflix. It’s one that should be seen on the big screen and in Dolby Atmos theaters if available. Less than twelve hours after watching, I’m still blown away by what I saw on screen. Warner Brothers Pictures opens Blade Runner 2049 domestically on October 6th in 2D, 3D, and select IMAX theaters. Sony Pictures Entertainment is handling the international distribution.